In April 2013 the airport "people mover" began operating between Terminal 4, East Economy Parking and the METRO Light Rail station. Currently, the PHX Sky Train DOES NOT access the Rental Car Center and West Economy Parking; that extension is slated for a future phase of the system. Those locations continue to serve connecting passengers with shuttle buses. Here is the short explanation, and here is a more detailed photo tutorial about the different transportation options at the airport. It can be confusing! 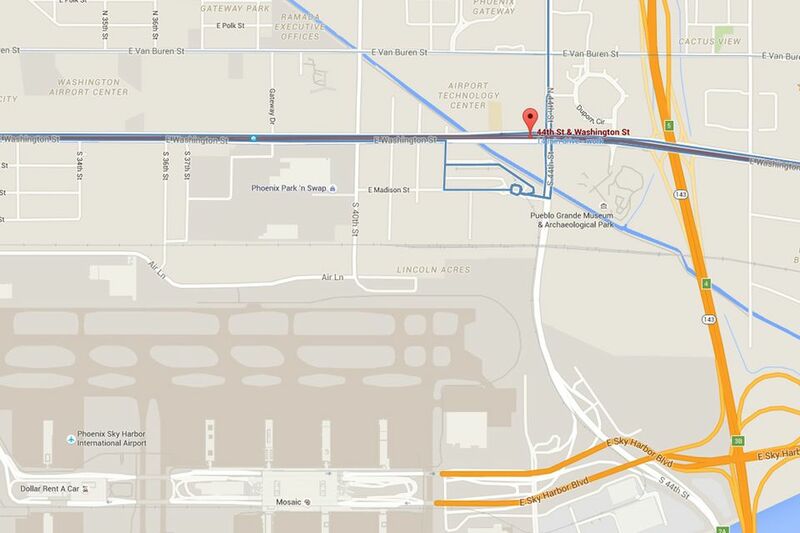 This map shows the location of the 44th Street and Washington facility for the PHX Sky Train. This is where people may access the PHX Sky Train to get to Terminals 3 and 4 and East Economy Parking, or where incoming passengers can connect to the METRO Light Rail system, 44th & Washington Station. From the west: Take the Loop 202 East (Red Mountain Freeway) to 40th/44th Street, Exit 2 and at 44th Street turn right (south). Drive one block past Washington to Madison Street and make a left into the PHX Sky Train Station. From Downtown Phoenix: Take Washington Street east. The entrance to the PHX Sky Train Station will be on the right BEFORE you get to 44th Street. If you pass it, just turn right at 44th Street and access the station from Madison, one block south of Washington. From the east: Take the Loop 202 East (Red Mountain Freeway) to 40th/44th Street, Exit 2 and make the first left (south) at 44th Street. Drive one block past Washington to Madison Street and make a left into the PHX Sky Train Station. Note: If you are driving west on Washington be aware that you can't access the PHX Sky Train station on Washington because there is a light rail station there. You can't turn left into the entrance driveway, only people on Washington driving east can do that. If you are driving west on Washington your best bet is to turn left at 44th Street and enter the station off Madison, one block south of Washington. You can use the Valley Metro Trip Planner to find the best connections if you are using public transportation to get to the PHX Sky Train. If you see a car rental company referenced as being right at the airport location, that's not true. There are no car rental areas at the airport itself. They have all been moved offsite to the Car Rental Center. If you see lines on the Google Map at 44th Street and Washington, those denote the METRO Light Rail line as well as a few bus lines that access that location. You can see this location marked on a Google map. From there you can zoom in and out, get driving directions if you need more specifics than mentioned above, and see what else is nearby. See driving times and distances from various Greater Phoenix cities and towns to Phoenix.